Lots Chinese is hard to download, and I must tell them to download form http://download.blender.org/release/, this is more quickly to visit, but I can't tell everyone, if possible please provide more links in download page, it's good for new users, very thanks. Leroy (Leroy) changed Type from Bug to To Do. Looking at the source for the https://www.blender.org/download/ page, I don't see any sign of 'blend4web'. If there is some redirection or browser highjacking taking place, it would be outside our control. Stephen Swaney (stiv) added a subscriber: Francesco Siddi (fsiddi). Update: apparently our back end is 'randomly' picking mirrors based on some criteria. Maybe something for @Francesco Siddi (fsiddi) to look at? 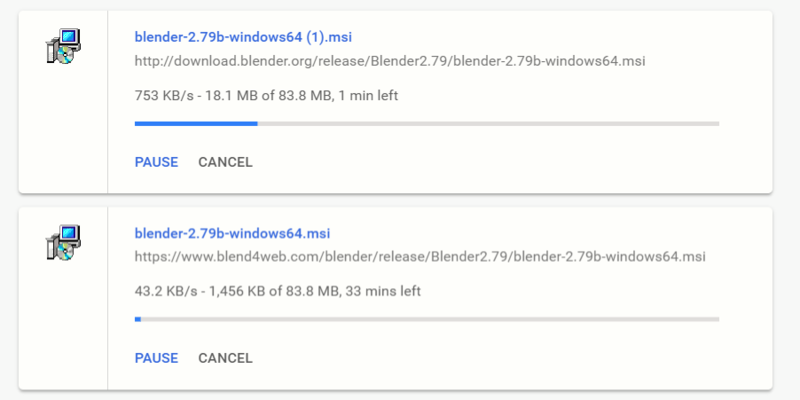 What is the speed if you get the file from http://download.blender.org/release/ ? blend4web in China area is not very stable if you don't used proxy. even sometimes no speed. Hi, for the moment I have disabled the Blend4web mirror - their SSL cert expired. We will look into a better solution for mirroring Blender downloads in Asia in the future. I'll close the issue, but please let us know if you have any further remarks. The krita did it well, many language version. just a suggestion, if you need, I can help you to translate in Chinese version, thanks.